*81% of retail investor accounts lose money when trading spread bets and CFDs with this provider. Founded in 1974 as a pioneer company of its kind IG (formally IG Markets ltd) been at industry forefront and actually built the concept of financial spread betting that introduced online dealing as early as in 1998. Currently, the company featuring global presence and providing trading solutions through offices in 13 countries located in the world’s key financial districts, which enables to reach clients across the world. The broker headquartered in London (UK) and including operation in USA, Australia, Japan, New Zealand, registered among Europe countries and Singapore. IG Group Holding plc is a member of the FTSE 250, the London Stock Exchange with one of the largest market capitalization of £3.1 billion (31 May 2018). Based on revenue excluding FX, IG is the world’s No.1 CFD and financial spread betting retail provider. Is IG safe or a scam? Is IG safe or scam? The IG group of companies is heavily regulated by the top leading authorities worldwide due to its global presence by the appropriate bodies in the territory it operates. As the principal office of the IG located in UK, the broker respectively authorized by the Financial Conduct Authority’s (FCA) regulation, while the stocks and shares ISA accounts provided by IG Markets Ltd and spread betting provided by IG Index Ltd. In addition, the IG company units regulated by the authorities in a number of countries, see table below, hence IG is well-maintained by regulatory authorities’ firm that sets high trading standards to follow and considered to be a safe broker. The regulations impose the first topic is the Client’s money protection, therefore funds safeguarded through a range of ways while money held in segregated accounts at regulated banks. That means money is never used for IG own business activity and are ring-fenced from the company creditors. Additional rules mandates broker to fall under compensation scheme which will recover clients deposits in case of insolvency, as well as authority regularly oversees the broker in terms of their trustability of the trading providing itself. All IG platforms have been designed for the traders’ convenience with a choice which device to use and almost unlimited capabilities. The broker aimed to create an easy-to-use platform while its technical development would take one of the primary roles, and indeed, IG made its job perfectly. IG platform received many industry rewards and traders compliments for its well-designed core and variety of capabilities. A proprietary platform is a web-based trading software which doesn’t require a download, along with trading applications optimized for most smartphones and tablets. The advanced platform features including direct market access (DMA) throughout its NDD connectivity, APIs and a possibility to transform it into the Specialist platform with flexible access and professional resources. However, you still can choose famous MetaTrader4 to execute your orders along with its advanced chartings and tools, in case it is a better option for you. 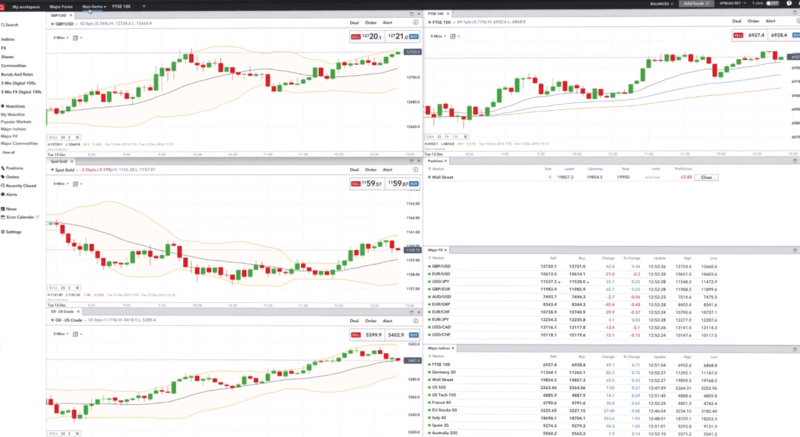 Additionally, all IG’s platforms enhanced with 18 free add-ons and indicators, Autochartist, a free VPS for an expert advisor, and range of small settings that remember trader deals. As well, trading apps enable spread bet and CFDs as a simplified process, which provides great benefit to the trader and leverage advantage. In addition, as a smart trading process requires effective risk management tools that help to protect capital, IG rewards traders by its widening range of stop and limit orders that keep track of funds easily with an always-visible snapshot of profits and losses. Therefore, all in all, IG platform and technology indeed one of the best offering among the industry to use. IG offers a range of products for online trading, with an original offering and the core on the business Contacts for Difference (CFDs) – the derivative contracts that client takes advantage on changes of asset’s price, without owning the asset itself. What is interesting the IG formed many of industry potential and was the first Australian CFD provider too. Besides, company trading offer extends to currency pairs, commodities, indices, stocks, financial spread betting (in UK and Ireland) and of course features current trend IG Cryptocurrencies trading through CFD pair on bitcoin, ethereum, ripple and more. In regards to account opening, IG made it is easy to understand a process, which doesn’t require downloads, just mandates a verification process and traders identification upon your choice of IG entity to trade with and the platform you choose. Furthermore, IG does not discriminate their clients based on the size of balance, there is only one basic account, which can be settled up into the trade in minutes. There’s also no obligation to fund account immediately, firstly account will be as a Demo Account allowing you to trade with virtual € 30,000 and then transfer it to the real trade by putting or deposit of funds. Another reflection of an IG global reach is excellent customer support with truly comprehensive educational materials that enhance trading potential and allows to improve your skills. Actually, IG is quite known for its advanced programs of webinars and online trading courses. You absolutely covered by prompt responses to queries in different languages, since the variety of offices truly represents all variety of nationalities and countries. Under the regulatory restrictions, which took resent change in Europe with an ESMA regulation, the residents of Europe will trade with the particular maximum level of leverage, or the multiplier. Another jurisdiction ratios are applicable to IG trading accounts according to the regulation impose limitations respectively and vary from one to another. Thus, the European resident traders are allowed to use a maximum leverage 1:30, while other entities may see a significant increase up to 1:200 on Forex instruments as Australian authority allows. For more detailed leverages see below the breakdown with an offered leverage to Cryptocurrency, Commodity, Share and Index instruments. The IG fee builds into the spread that is variable on underlying market prices and may increase due to widen market prices. Spread will be paid on every spread bet or non-share CFD, with the average about 0.6 pips on Forex, and with a commission on every share CFD or share dealing trade. Generally, at IG margins are among the lowest in the industry and a very comfortable to use even for the beginning traders, since there are no additional fees. IG spread breakdown presents according to reference to the minimum of CFD or MT4 account fee (spread) and the Spread Bet minimum size, which also varies under the IG office you trade with. (Check the most recent spreads on official IG website or platform). For instance, you can check out and compare IG fees to another reputable brokerage eToro. Another important topic is a money transfer to and from the trading account, while the IG implemented a transparent method to transactions that are passing relatively quickly, you can also choose a best suitable way for you to transfer funds. IG Minimum deposit. There is no requirement on a minimum deposit, as well as an additional fee for you to transfer the money. (Yet, verify with particular jurisdiction deposit conditions). So a trader can choose a best suitable payment option among major debit/credit cards, bank transfer, using PayPal system, Skrill or Neteller deposit funds according to initiate trading costs and start trading almost instantly. IG withdrawal fee is good news for traders, as the company does not charge any commission for money withdrawals. 0$ fee is applicable on minimum withdrawal of 150$, while funds usually arrive at your account within 3-5 business days. As a result, the IG group as a large internationally presented broker with its 40 years of experience standing at industry origins, hence is a very reliable, well-organized and regulated broker. There are not many brokers, who can reach the same high standards of operation, as the IG group does. Competitive IG conditions for trading offer a range of products, the advantage of leverage position to clients own perspective, as well as splendid technical, customer and regulation support. All achievements seem absolutely impressive, along with numerous received awards and thousands of global traders engaging daily that overall define worth of attention to the traders of different level and expertise. * Spread bets and CFDs are complex instruments and come with a high risk of losing money rapidly due to leverage. 81% of retail investor accounts lose money when trading spread bets and CFDs with this provider.